Celebrating a Muslim holiday in Michigan. CIP Executive Director Stephen Suleyman Schwartz at podium of Ashura observance, Michigan, 2009. The Muslim holiday known as Ashura, the 10th of Muharrem in the Islamic calendar, fell on January 7 this year. Ashura is an especially sacred occasion for Shia Muslims. It commemorates the death of Imam Hussein, the grandson of Muhammad, at the battle of Karbala in Iraq in 680 CE, when Hussein and his supporters were defeated in a rebellion for justice against the tyrant Yezid. On Ashura, Shias also express their remorse at the failure of his partisans to sufficiently rally to Hussein's side. Islamic theology equates Ashura, because of this element of repentance, with the Jewish Yom Kippur, or Day of Atonement. The Shia drama of Ashura and Karbala is known to the non-Muslim world mainly from grotesque images sent around the world by television, for as Shias mourn the death of Hussein, they often wail loudly, their eyes streaming with tears, and may beat themselves with their fists or flog themselves in contrition. Sometimes this flagellation is carried out with knotted whips, even during parades in New York; sometimes with chains, in Beirut or Tehran; and in the past the participants commonly drew their own blood by cutting their scalps with swords. Although in recent years voluntary bloodletting has been forbidden by Shia clerics, it tends to be revived when Shias find themselves in extremis. Signpost at Bektashi Teqe, Michigan, USA. Photograph 2009 by Stephen Schwartz. In Iraq, Saddam Hussein had suppressed Shia observances, and after U.S.-led forces liberated the tomb of Imam Hussein in Karbala in 2003, millions of Shias flocked to the site for Ashura. In contrast with the annual hajj pilgrimage to Mecca in Saudi Arabia, which typically produces fires, stampedes, and resulting deaths, the first free convocation of Shias in Karbala in many years was carried out without fatal accidents, disorders, or even serious inconvenience. But the Shias were then so unrestrained in their exaltation that many in Iraq opened their veins in the forbidden practice. Since then, Ashura in Iraq has typically been accompanied by anti-Shia violence, as al Qaeda and other Wahhabi extremists incited from neighboring Saudi Arabia have attacked the Shias. This year two million devotees traveled to Karbala. Iraqi authorities mobilized 30,000 soldiers to protect them, and reported various terrorist attacks aiming to disrupt the occasion. Such incidents included the slaying of 38 people and injury of 70 when a male suicide bomber dressed as a woman entered the Imam Musa Kazim Shia shrine in Baghdad on January 4. The shrine was then closed to women. A real female was arrested on January 7 when, with bombs strapped on beneath her garments, she joined a Shia parade marching to Karbala. In Pakistan, authorities reinforced local security for the Shia minority, which has been repeatedly slaughtered in their mosques and on the streets. 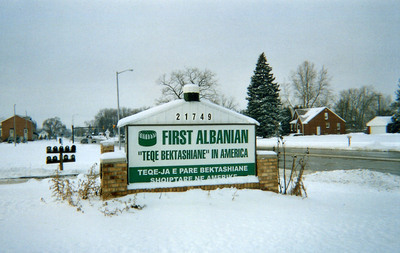 The main building of the Bektashi Teqe, Michigan, USA. Photograph 2009 by Stephen Schwartz. Ashura has its more sedate aspects; after the ritual outpouring of grief, believers will gather for a collective meal, typically concluding with consumption of a pudding made of sugar or honey, nuts or dried fruit, and rice or wheat. The sweet dish is also called Ashura, and is usually given to the poor. The American Muslim community includes hundreds of thousands of Shias, mainly Iraqis and Albanians centered in Michigan. But while American Arab and American Pakistani adherents surrender themselves to histrionics and self-mutilation, the Balkan Shias are more subdued, as seems appropriate for a memorial occasion. Their Ashura event resembles a wake held by a fraternal order more than a Middle Eastern outburst of emotion. I spent the weekend of January 10-12 in Detroit at the annual Ashura tribute held at the large meeting hall of the Bektashi Sufis, an Albanian mystical order. 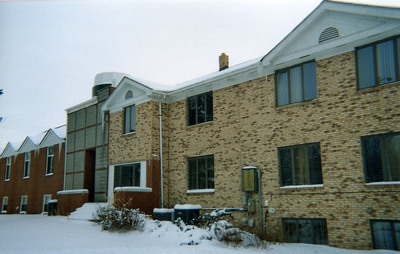 Outside the building, snow was piled high, but the roads were clear. Inside, there was no weeping, shouting, or flogging, and with hundreds of men and women in attendance, not a veil or heavy female covering was to be seen. Many images of Hussein and his father Ali, the son-in-law of Muhammad, were, however, on display, along with the American flag. The Ashura ceremony among the Bektashis included a speech by a Catholic priest, Father Anton Kqira of St. Paul's Church in Rochester Hills, Michigan. He addressed the Sufi audience as his "brothers," and was followed by a warm greeting by a local Sunni cleric, Imam Shuaip. The Sufis were represented by their local leader, the venerable Baba Arshi Babai of Albania, and Baba Edmond Brahimaj, who has led Sufi resistance against Saudi-financed Islamist aggression in Macedonia. The main local community figure was Ekrem Bardha, a successful businessman who supports many public efforts for the common good in America. 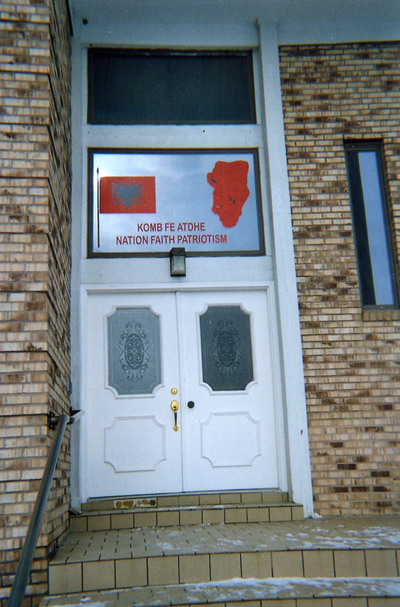 Doorway of the Bektashi Teqe, Michigan, USA, 2009 With Albanian patriotic symbols, Photograph by Stephen Schwartz. 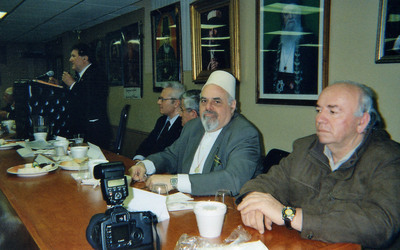 When the Bektashi Sufis established themselves in Michigan in 1954, the founder of their center, Baba Rexheb Beqiri, wrote on their first Ashura in the United States that Imam Hussein was persecuted and slain at Karbala because he defended a constitutional attitude toward religious rule, liberty, and the welfare of the people. Hussein, according to Baba Rexheb, "kept alive the flag of liberty, the prestige of religious democracy." The people rebelled against the injustices of their rulers, but evil usurpers replied with "terroristic actions." This anticipation by a Balkan Sufi exile in America of the key questions in the relations between Islam and the West a half-century afterward is more than remarkable. The principle of "religious democracy"--meaning democracy within religion, not a political system based on religion--comprises a great challenge to Sharia-driven conformity in Islam, and the description of Muslim tyrants maintaining their position by terror could be taken from the pages of any newspaper in the world today. The Balkan Shias who gathered in snow-covered Michigan to observe Ashura demonstrated that an American Islam--as American as it is Muslim--exists. It is a bulwark of civilization against extremism, standing for peace and mutual respect between faiths, and appreciative of the opportunity to mourn a Muslim hero in safety and freedom.